While none of them are really known for being comic strips, having debuted in other media, they did all technically have comic strips at one point. I was thinking that Peanuts had been something of a mainstay of philately, but evidently, the first Peanuts stamp did not debut until 2001. The most recent ones from 2015 were specifically focused on A Charlie Brown Christmas animated holiday special. A curious piece I wasn't expecting to find was that, in 2010, Pulitzer Prize-winning editorial cartoonist Bill Mauldin was featured on a stamp. The stamp features a photo of him, as well as drawings of two of his recurring characters, Willie and Joe from his Stars and Stripes strips. From what I can tell, the USPS tended to shy away from fictional characters until the 1990s. Prior to that, there were only a few instances where a fictional character was honored, and most of those were of the "personification of an idea" variety: Victory, Freedom, etc. In the 1970s, they started getting a little more in pop culture with the likes of Santa Claus and Tom Sawyer. (Yes, the first stamp featuring Santa didn't come out until 1972.) Smokey the Bear and McGruff the Crime Dog show up in the 1980s. But it's not until the '90s where the USPS starts anything with pop culture, and it's not until that 1995 release of "Comic Strip Classics" that we start seeing references to pop culture on a more regular basis. But that's who all I can find. Did I miss anyone? I must've. 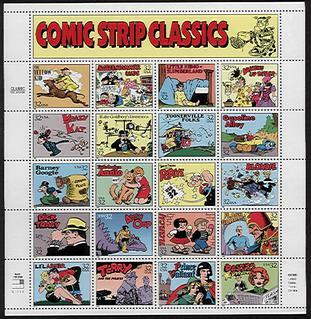 What other comic strips have found their way onto US postage stamps?